At Seyfarth, we are continuously looking for ways to meet our clients’ needs for value and efficiency while maintaining the high quality of our services. That's why we created SeyfarthLean®, our proprietary, value-driven client service model, which combines the core principles of Lean Six Sigma process improvement with project management and tailored technology solutions. 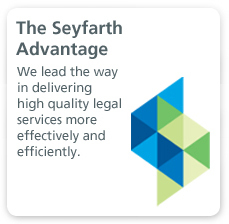 For almost ten years, SeyfarthLean has been unique to the legal profession and a contemporary approach to providing, delivering and managing client and legal services. 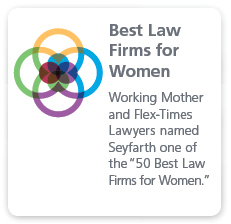 SeyfarthLean has been at the center of a number of awards and recognitions for our focus on innovation in the delivery of client and legal services. “Innovative Project” and “Innovative Law Firm” of the Year. For two years in a row, Seyfarth has been honored with the Innovative Project of the Year award from the International Legal Technology Association (ILTA). The 2014 award recognizes our work in creating SeytMap, an interactive process management tool, and follows our 2013 award for SeyfarthLink and Innovative Law Firm of the Year. Financial Times US Law Firm Innovator. For the fourth consecutive year, Seyfarth earned a spot in the Financial Times “US Innovative Attorneys” index of the most innovative firms. In 2014, Seyfarth took the top rating for Innovation in the Business of Law category, receiving "standout" honors for the success of SeyfarthLink as a platform for delivering innovative client solutions. The recognition reflects the ongoing efforts of the firm to lead the way in integrating legal excellence with innovative client solutions. Association of Corporate Counsel (ACC) “Value Champion.” For two consecutive years, Seyfarth has been honored to be one of only a handful of law firms to be recognized in the Association of Corporate Counsel “Value Champions” awards program. In 2013, the firm was recognized for creating a bundled technology solution which significantly improved the quality and efficiency of a client’s large contract management program. The firm has also been recognized for its work in reengineering clients’ approaches to selecting, managing and evaluating outside counsel using Lean Six Sigma methodologies. 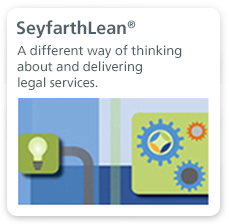 To support our SeyfarthLean approach, we created SeyfarthLean Consulting, a dedicated team of 30 technologists, legal project managers, data analytics specialists and process improvement professionals, who work with clients and law firm partners to improve the delivery of legal services. Learn more here.